We have edamame growing and it looks good, but the beans are still a bit small. We are hoping to have some ready for you all in a few weeks. As far as I am concerned, fresh ripe tomatoes are the true harbinger of summer, and, well, let’s just say summer is definitely here. 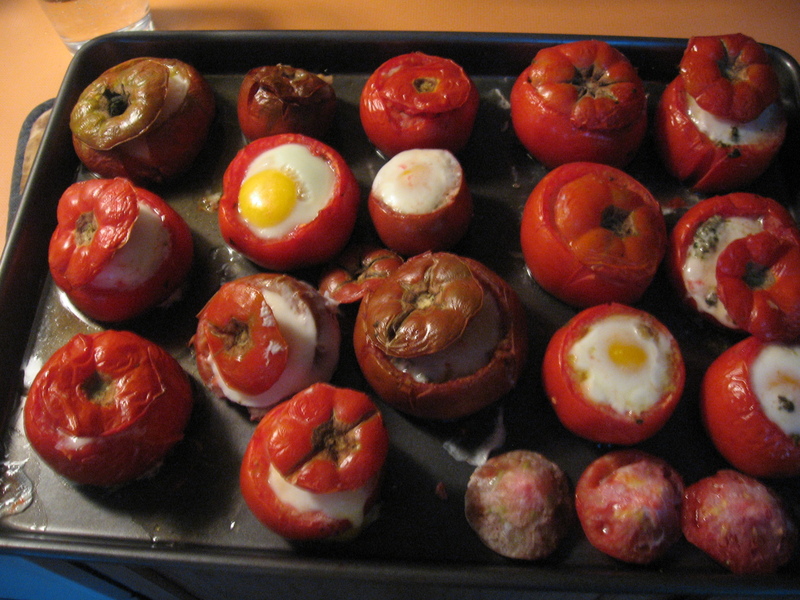 Now, I know that it’s not exactly difficult to think of things to do with a tomato. I asked one man at the market on Saturday what his plans were, and he seemed shocked that I even had to ask. “They’re going on the burgers, of course,” he said. Of course, the burgers– and the salad and the gratin and the pasta sauce and the stir-fry… I guess what I’m trying to say is that maybe you don’t think that you need four more things to do with a tomato, and I understand why you might think that. The thing is that you’re wrong. Don’t believe me? Then you obviously haven’t tried making your own barbecue sauce with our cherry tomatoes. If you’re not making it yourself, you don’t know how delightfully fresh BBQ sauce can be– and you’re probably getting more preservatives and sugar than you think. Aaron cooked up this really awesome sauce for dinner the other night, and I think that you’ll be pleased by how easy it is to make and how deliciously sweet it is for having practically no added sugar. It’s good for meat (or so I’m told– and on this note, I think the kids might even like to dip chicken nuggets in it)), and it’s great with grilled veggies, potato pancakes, and polenta. 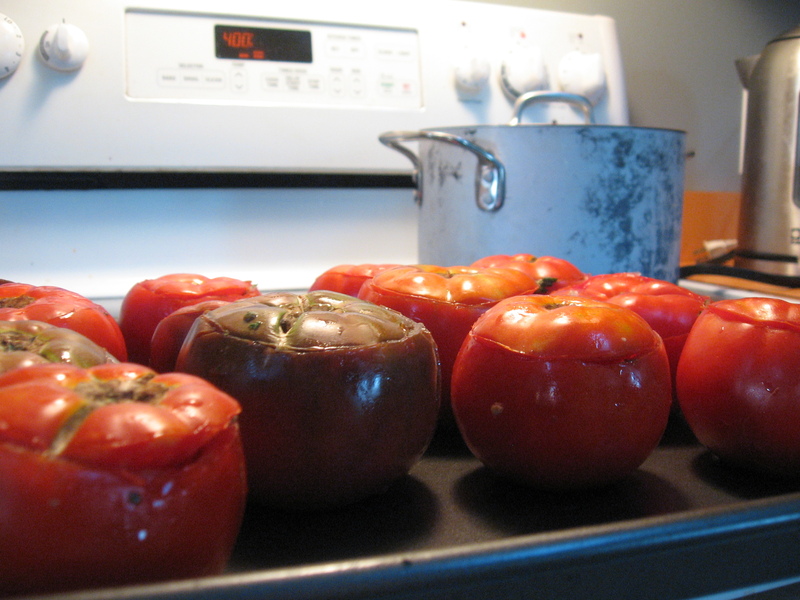 Use a food processor or blender to puree the tomatoes. Add the onions and garlic and blend until all the ingredients are finely chopped and mixed, adding vinegar as needed. Pulse in the remaining ingredients. Transfer the mixture to a medium sauce pan and cook, stirring on medium heat until it reaches you favorite consistency. If you’re not in the mood to fire up the grill, though, you can follow Theresa’s lead and make pizza sauce and freeze it for later. The great thing about this dinner is that all you have to do is pull out your pre-made sauce, buy (or make) a dough, and cut up your favorite toppings. And, because you’re using fresh, vine-ripened tomatoes, the sauce is easy as pie (so-to-speak): you don’t really need to add anything fancy to it. The recipe is simple, so there’s also plenty of room to tweek it however you like. Personally, I have a credo about these kinds of things: More garlic, a pinch of lemon. 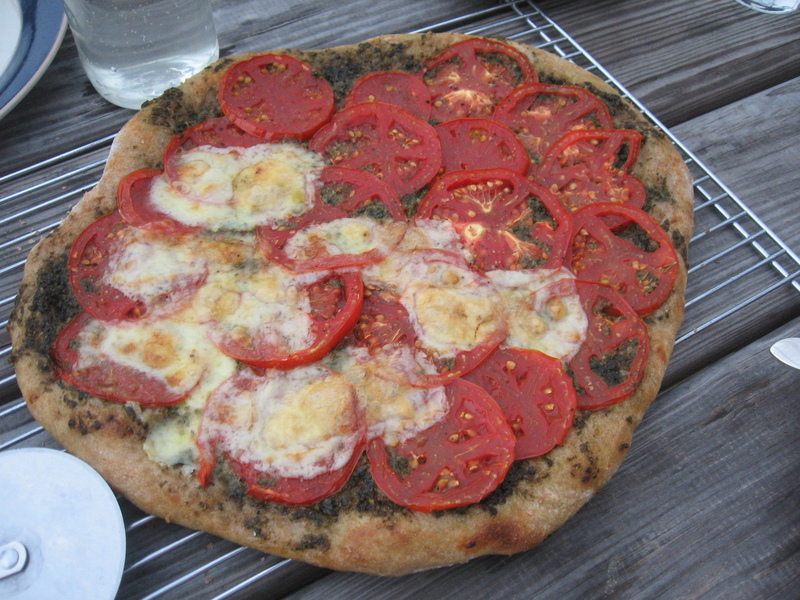 If you’re not in the mood to cook ahead, though, our favorite pizza of the night was the one that Theresa slathered with pesto (though I think olive oil or any tapenade would do) and then cooked with fresh sliced tomatoes. What I’m trying to say is that you can be lazy and/or creative, and everything should still be delicious. Saute onions and garlic in oil until onions are translucent, add salt, add tomatoes, and simmer on low heat, stirring occasionally until everything has cooked down. Add any fresh herbs and cook, stirring for a couple of minutes. Add lemon if desired. 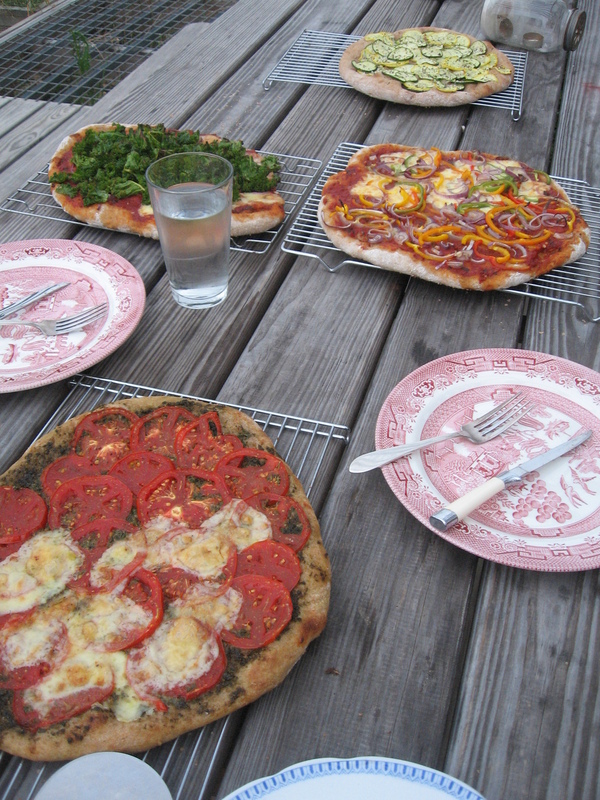 Slather on pizza! My favorite recipe of the week has to be this one that Kayla made and sent to me. It’s hearty, delicious, and the perfect thing to find waiting for you after you’re finished packing up a CSA pickup on a cold and rainy summer night. It’s good with rice, quinoa, or some of Mark’s bread (if you have any left from Tuesday pick-up by the time you have time to cook. …we don’t always.) It doesn’t look like a lot in this picture, but it’s really freaking awesome. Place the eggplant in a colander and sprinkle with salt. Leave in the sink for 30 minutes to allow bitter juices to escape. Rinse with cold water and dry on kitchen paper. Drain the chickpeas and put in a pan with enough water to cover. Bring to a boil and summer for 1 hour until tneder. Drain. Heat oil in a large pan; add the garlic and onions and cook until soft. Add the spices, stirring for a few seconds. Stir in the eggplant to coat with the spices and the onion. Cook for 5 minutes. 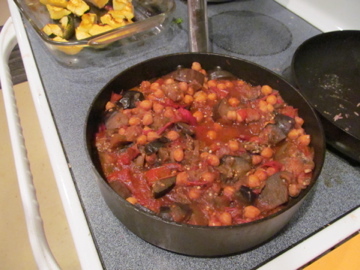 Add the tomatoes and chickpeas, and season with salt and pepper. Cover and simmer for 20 minutes. 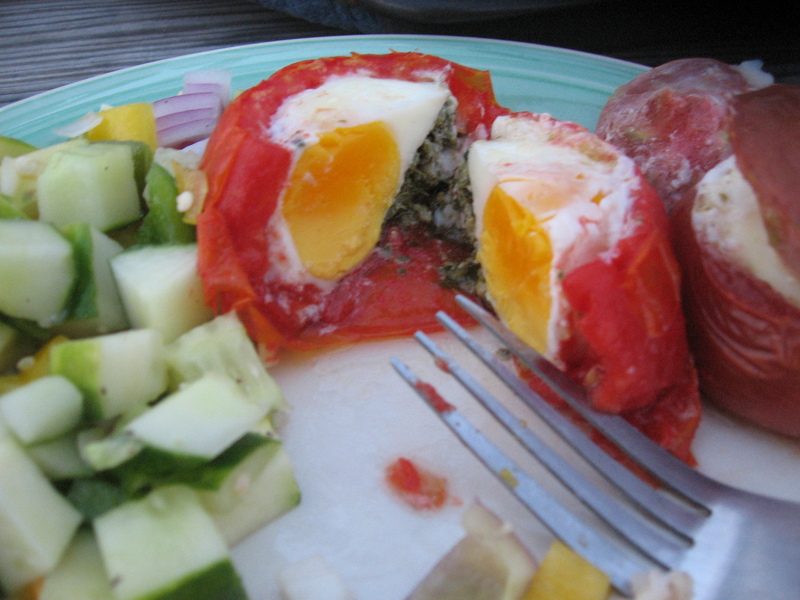 I also made this kind of stupid dish where I hollowed out a lot of medium-sized tomatoes and stuffed them with pesto and egg. I followed this basic recipe from Deb at Smitten Kitchen, but I substituted basil pesto for the romaine and had a bit of trouble with our oven. The result was OK, but if I had to do it over again, I’d follow Deb’s advice and also be sure not to cook the eggs to the point where the yolks harder. I think that the beauty of this recipe would be in the running yolks. On the upside, the tomatoes really are the star of the show in this dish, so maybe that’s something and you could probably put the stuffed tomatoes on top of a fresh green salad if you wanted to be gourmet about it. Lettuce mix and sweet corn are back again this week. Some more varieties of our hot peppers are coming in now including the mild anaheim peppers and the poblanos. Our cucumbers have dropped in production so we won’t have many to offer this week or the next. Perhaps a later planting will yield better. Our second round of beans is just about ready, so it looks like we’ll have some to pick for you all next week. So first I’m gone for three weeks and now, all of a sudden, you can’t get rid of me. I’m like that person that you dated but just could never quite figure out in college. (Don’t dump me: I’m better than this, really!) But, to continue the catch-up work that I started earlier with that cabbage post, I’m back to update you on last week’s vegetable spotlight challenge. If all goes according to plan, you should have this week’s update by Wednesday at the latest– but, then again, I do work on a farm, and we are in the middle of summer harvest, so don’t hold me to that. 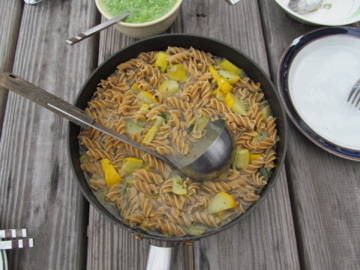 Anyway, last week, we focused on summer squash, and I will confess, I have occasionally been known to suffer from S.S.F.S.– have you heard of it? Summer Squash Fatigue Syndrome. I actually started this bout last August and haven’t been able to kick it since. The disease is characterized by a generally malaise in the kitchen, a loss of interest in old hobbies (like stir-frying), and an irrationally fear of zucchini bread, and it generally strikes anywhere from mid-July to September. Some experts claim that it is especially prevalent among home gardeners in the Northeastern and mid-Atlantic regions of the United States. Often, doctors prescribe abstinence from summer squash as a cure, but I’ve been undergoing a more radical experimental treatment, full immersion therapy. I’m happy to say to you today that it has been working– and with great success. Suddenly that crown-shaped flying saucer squash is in everything that I cook. So, today, I come bearing a message: embrace the squash; don’t fear it. As part of the therapy last week, we tried to get a little creative. Kayle made a soup that would put any S.S.F.S. sufferer in recovery. Hell, I even treated myself to seconds. Do not, and I repeat, DO NOT skip the salsa verde. Slice the squash into quarters and then again crosswise into 1/2 inch thick segments. Warm the oil over medium-high heat. Add the onion, squash, and herbes and cook for 5 minutes. Seqson with 3/4 tablespoon salt and add the water or vegetable stock. Bring to a boil, then lower the heat and simmer, covered until the squash is tender, abotu 15 minutes. Taste for salt and season with pepper. 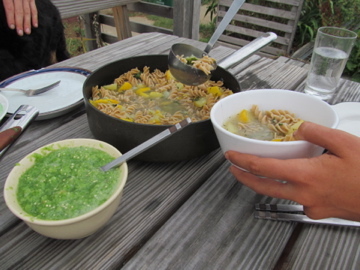 Boil the pasta and add to the finished soup with a spoonful of salsa verde in each bowl. Genius that she is, Kayla opted for the Smitten Kitchen salsa verde recipe over Madison’s. 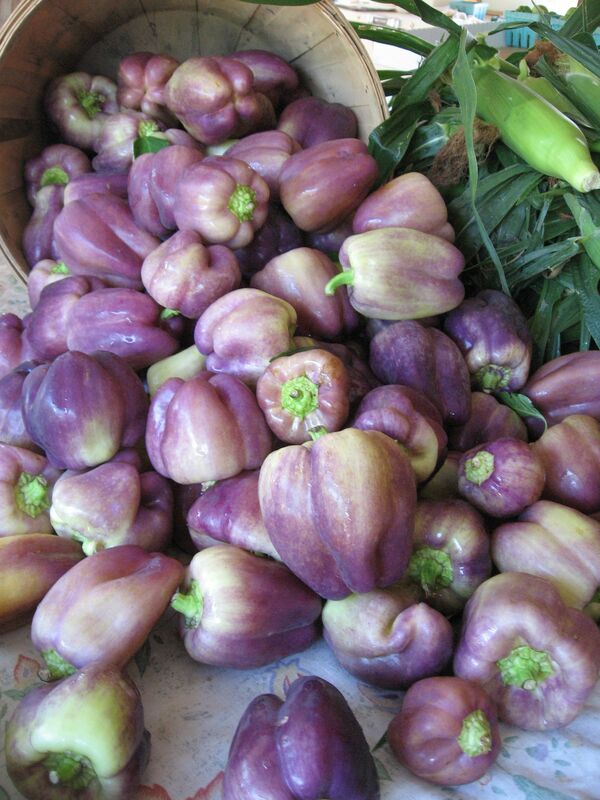 The latter didn’t have tomatillos, you see, and we definitely did. I was less creative, I have to admit, being that I’m still in recovery and all. I did, however, do the most sensible thing that I could think of at the time: I roasted the squash and tossed it in pesto. This is a fool proof-method for making just about anything delicious, but I think that it works especially well with summer squash. The reason is that when roasted correctly, the squash maintains a succulent crunch and seeps up all the juicy flavors of the olive oil, but it’s still relatively low in calories– all of which makes it a perfect vehicle for the smooth, flavor(and calorie)-packed pesto. So, I cut the squash into coins and tossed in olive, salt, and pepper. I spread it on a baking sheet and cooked it at 400 degrees for about 15 minutes, stirring regularly, until the squash began to brown on edges. 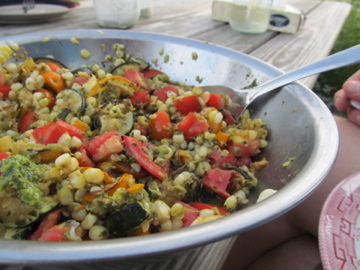 I tossed it with fresh sweet corn kernels, and chopped cherry tomatoes. We ate this on top of socca bread– which is a delightful Greek food that I’ll probably write more about at another time. It’s made by combining equal parts chickpea flour and water, a little olive oil, rosemary, and salt– which you can cook either as small crepes or as a larger pancake as I did here. If you’re interested in trying it out, there’s a good recipe here, though I recommend using rosemary instead of cumin, depending on the recipe that you’re preparing the socca to accompany. Aaron also made zucchini bread, but I couldn’t find the recipe now that it’s time to post this. If you’re looking for a good version of the classic that uses more zucchini than it does flour, leave a comment below, and I’ll not only send you the recipe, but I’ll personally save you one of those over-sized zucchinis that are just absolutely perfect for the lazy baker to deal with. First of all, I’d like to apologize for taking such a long hiatus! I know, I know, I said that I would write you next week, keep in touch, make sure you knew that I still loved you. But the weeks have been busy and sweaty, and– long story short– I just haven’t been able to muster the will-power needed to upload this many pictures using a short bandwidth and a six-year old lap top. Anyway, I just want you to know that it wasn’t you; it was me. I promise not to neglect you or your dinner plans for this long ever again. Now, for the good stuff. And cabbage is, no matter it’s reputation, really, really good stuff. Whatever bad name cabbage has gotten is definitely the fault of the recipes and chefs that like to drown it in mayonaise or boil it down to a chunky mush– and not the fault of the vegetable itself. The truth is that cabbage is not only one of the cheapest, most nutritious, and best storing foods in the world, it can be used in a myriad of delicious ways. (If you don’t believe me, try googling “grilled cabbage” or “golumki.) It also has the added benefit of being quick to prepare, which I hope that this week’s recipes can demonstrate. 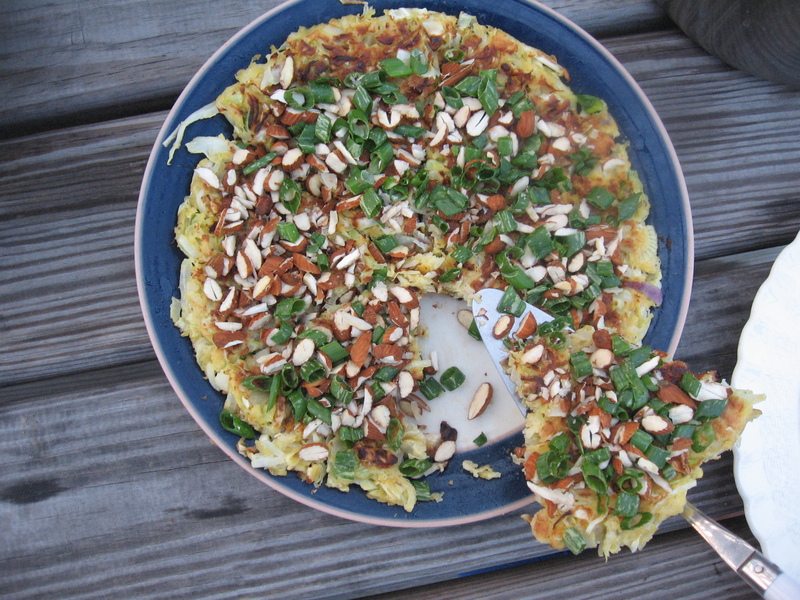 First up, we have Okonomiyaki, or Japanese Pizza, as adapted from Heidi Swanson’s recipe over at 101 Cookbooks. I have tweaked the ingredients list a bit for our CSA share, but the method is 100% Heidi’s, as is the write-up thereof. Heat a large skillet over medium heat and add a generous splash of olive oil. Scoop the cabbage mixture into the pan, and using a metal spatula press it into a round pancake shape, flat as you can get it. Cook for 4-5 minutes, or until the bottom is golden. To flip the okonomiyaki, slide it out of the skillet onto a plate. Place another plate on top and flip both (together) over. If you need a bit more oil in your skillet, add it now, before sliding the okonomiyaki back into the skillet. Again press down a bit with a spatula and cook until golden on this side – another 3 -5 minutes. 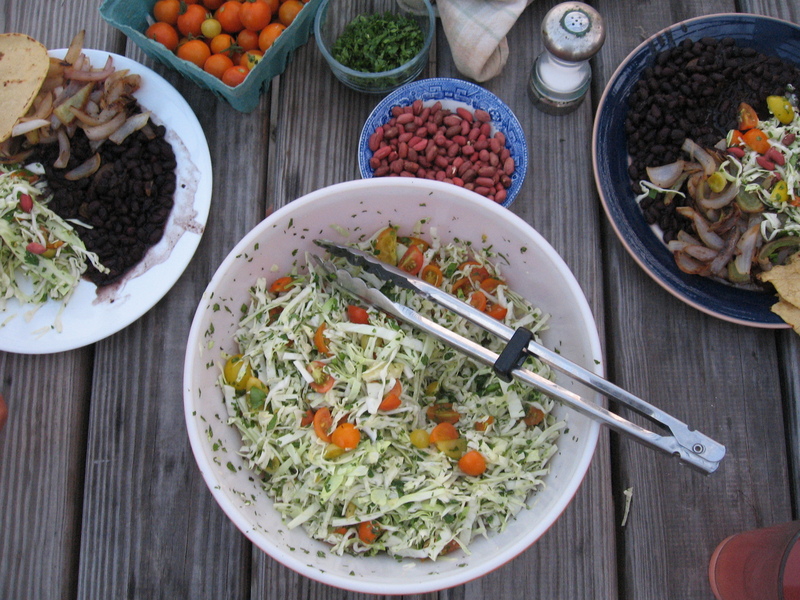 Also from 101 Cookbooks this week, we have the right recipe for all of you going to summer barbecues and pot lucks but are getting tired of the same old cole slaw. 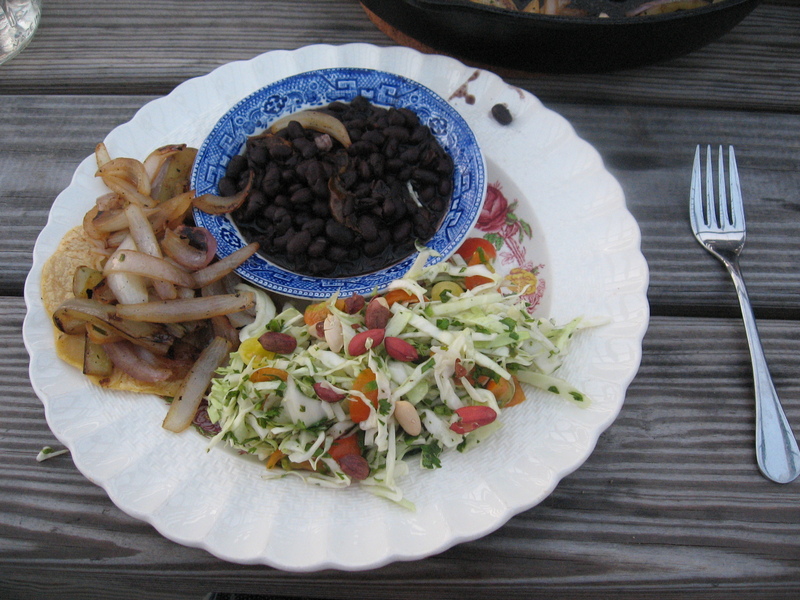 This is also delicious for a side dish on a hot summer night, which is how we ate it– on the side of (and also on top of) corn tortillas with stewed black beans and sauteed onions and peppers. 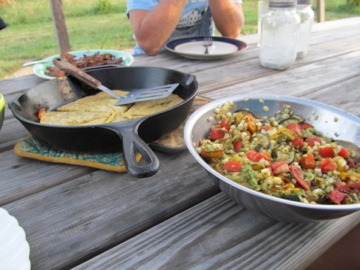 I’d say that this is one of the most delicious meals we’ve had all summer (credit goes to Theresa). PLUS, this is the perfect place to put those delicious cherry tomatoes that we’ve been handing out to use. Leave out the jalapeno if you like it milder. I also thought about adding shredded, baked tortilla chips (like the ones from the tortilla soup recipe). Also, I’ve mentioned this before – I try to seek out organic peanuts. Cut the cabbage into two quarters and cut out the core. Using a knife shred each quarter into whisper thin slices. The key here is bite-sized and thin. If any pieces look like they might be awkwardly long, cut those in half. Combine the cabbage, tomatoes, jalapeno (opt), and cilantro in a bowl. In a separate bowl combine the lime juice, olive oil, salt. Add to the cabbage mixture and gently stir to combine. Just before serving fold in the peanuts (add them too earl and they lose some of their crunch). Taste and adjust the flavor with more salt if needed. AAnd, last but not least, we’ve got a bangin’ vegetarian main course recipe using red cabbage. Kayla threw together this incredble stir-fry from Nick Kindelsperger at Serious Eats. I know that looking at it, the recipe seems a little labor intensive, but when you consider that it makes a hearty one-dish dinner (though we had some rice with ours), the effort is far outweighed by the result. The meal is spicy but doesn’t pack too much heat, satisfying, and nutrient-packed. Definitely good for impressing company or for eating as leftovers for lunch for the rest of the week. Dry off tofu with paper towels. Dump flour onto large plate. Add half of tofu and toss gently until evenly covered. Shake off excess. Pour four tablespoons ghee or oil into 12-inch iron skillet set over medium-high heat. Heat until shimmering. Add flour-coated tofu. Cook tofu, turning occasionally, until golden brown on all sides, about five minutes total. Remove tofu and drain on paper towel-lined plate. 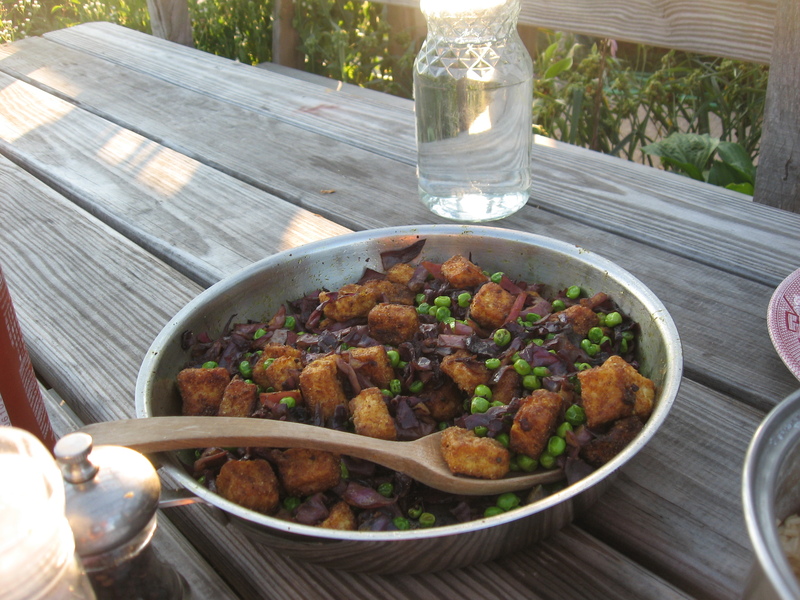 Turn off heat, carefully clean out skillet, and repeat with remaining tofu. Pour last two tablespoons of ghee or oil into medium-sized dutch oven set over medium high heat. Heat until shimmering. Add mustard seeds. Cook until they start to pop, about 30 seconds. Add ginger, two teaspoons coriander, turmeric, asafetida, and serrano. Stir well, and cook until fragrant, about one minute. Add cabbage and pinch of salt. Cook, stirring every minute, until very tender, about 15 minutes. Add remaining coriander, fried tofu, peas, and another pinch of salt. Stir well and cook until everything is warm, about two minutes. Season with more salt to taste. Serve with white rice. 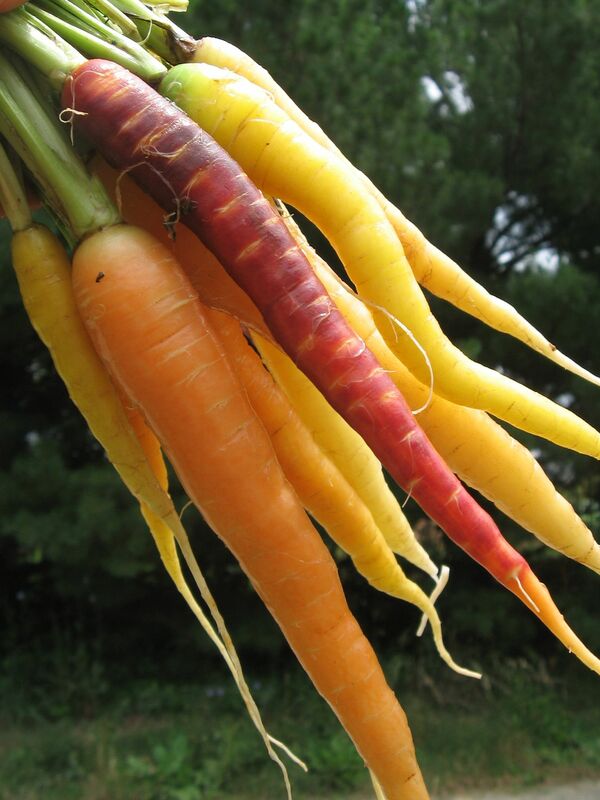 Each week I will send out a list of what we expect to harvest and distribute to our CSA members that week. But, please remember that this list is just an estimate based on a quick walk-through of our fields and not a guarantee of what will be at the pick-ups. What we are actually able to harvest may change according to how things look when we are out in the fields that day. We’ll also have cilantro and dill again this week. Our first plantings of green beans and sweet corn have come and gone but our second rounds will be ready to pick soon. We’ll most likely have sweet corn again next week. The beans may be ready but they may also take a bit longer. We don’t have lettuce available this week but should have it available again soon, perhaps as early as next week. 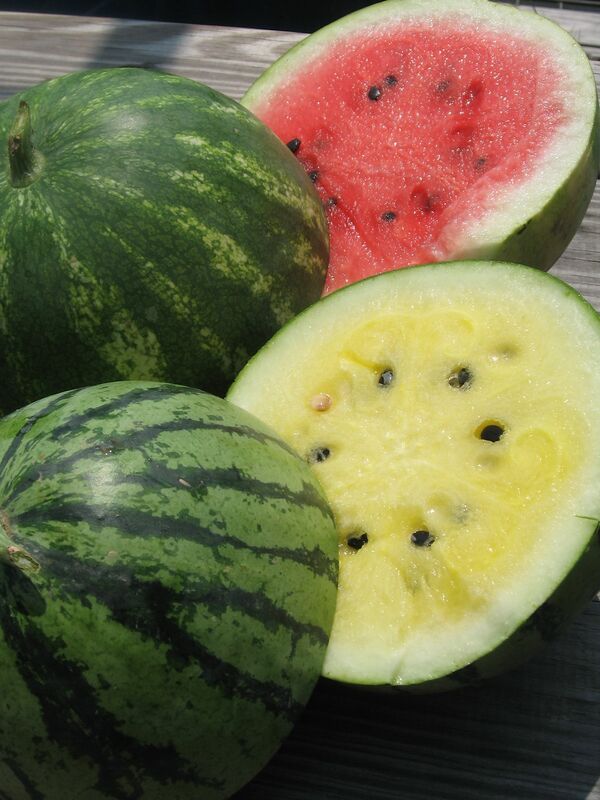 Many of our summer crops are starting to arrive (sweet corn, eggplant, squash and cucumbers) with a few still just around the corner: tomatoes, peppers, and watermelon are all coming soon. As each day passes, more and more cherry tomatoes are ripening. We have only found a few ripe red and heirloom tomatoes so far, but soon we will have some for you all. Watermelons are also only a week or two away. We found one that was close but it still wasn’t fully ripe and sweet inside. Here at Colchester Farm, we did not spray our sweet corn with any pesticides, so I wanted to send you all a friendly warning that you may find some critters in your ears of corn. During harvest, we opened a few up to see how the corn looked, and in a few we found corn ear worms living in the tip of the ear. There was only a little damage at the tip with the rest of the ear untouched. At the pick-up, please feel free to peel off some of the husk and peak inside to see how your corn looks before taking it home. We’d be happy to cut off the tips for you if there are ear worms present. We hope you will still be willing to give the corn a try because it would be a shame to let a few worms get in the way of this sweet, delicious corn.